If you’re short on time and seeking to experience the best of Uluru and the outback, camp under the stars and enjoy sparkling wine while taking in the amazing Uluru sunset, this is the tour for you! This overnight camping experience starts at Alice Springs or Ayers Rock and ends in Ayers Rock on day 2. The awesome bits: Uluru experience, Uluru sunset with glass of bubbly, Uluru & Kata Tjuta sunrise, Kata Tjuta Valley of the Winds and Aboriginal culture. This overnight camping tour starts at Alice Springs or Ayers Rock, and ends in Ayers Rock on day 2. If you’re starting the tour in Ayers Rock we will pick you up from the Outback Pioneer Lodge (Ayers Rock Resort), or from the Ayers Rock Airport. 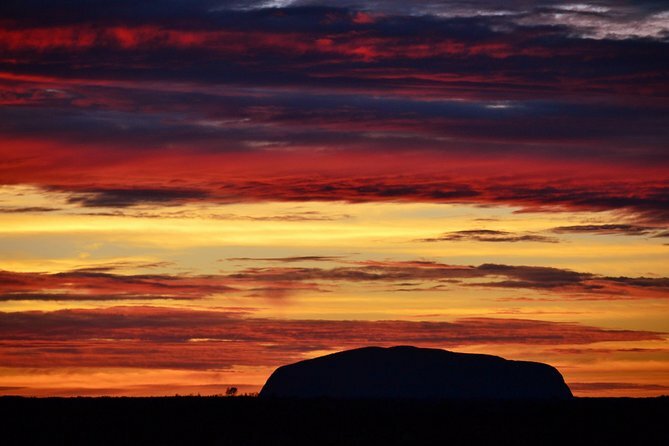 Enjoy a glorious sunrise with a walk around the base of Uluru. Deepen your understanding of the land and the Mala people during a walk with your tour guide. There’s an opportunity to purchase Aboriginal arts and crafts at the Cultural Centre before returning to camp for lunch. Lohnenswerte kompakte Tour, entsprach genau der Beschreibung. If you cancel between 8 and 30 day(s) in advance of the scheduled departure, there is a 50 percent cancellation fee. All campsites have hot showers and toilets, screened kitchens with electricity to charge cameras or phones, and permanent 4 share safari tents at all campsites.